Customized and standard vitamin premixes manufactured for improved performance. Lotus adds a nutritionist's point of view to its vitamin premixes to meet animal’s requirement of nutrients. Vitamins are essential organic compounds vital to normal metabolic processes of animals. Vitamin nutrition, is a small part in animal diet nutrition, but is critical to the well being and top performance for every animal. Lotus Trace Mineral premixes offers safe solution to meet the requirement of animal micronutrients to maintain good health, production and reproduction. Lotus TM premixes occur as standard formulation for poultry, Dairy, and Aqua sector. Physical and chemical characteristics of minerals. Screening potency of raw materials following stringent EU specifications. Following the regulations of ISO standards. Evaluating of CV for excellent homogeneity. Safety: Key considerations include the devoid of heavy metals, toxic compounds, and antibiotics. Bioavailability: Preferably sulphate salts without lumps are followed. Particle size: preferable parameters to inhibit segregation. 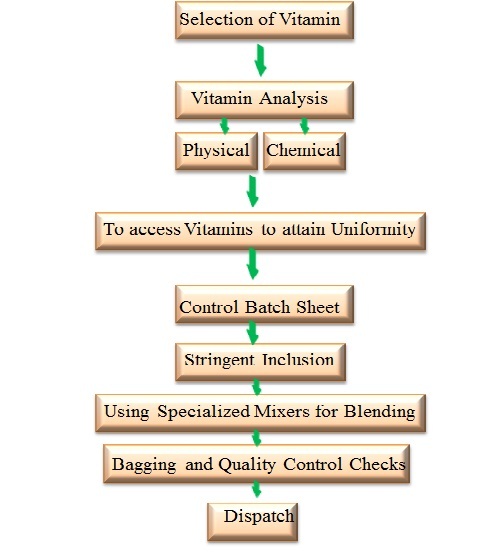 Bulk density: Incorporates formulated carrier and active selection of trace minerals. Economy: Meet Nutritional requirement economically.